This week in our Middle School advisory sections, we kicked off our digital literacy instruction with two very important topics. 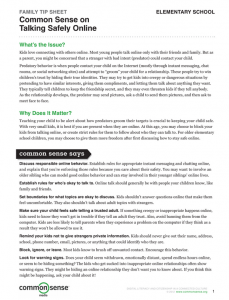 In the 5th and 6th grade, Students discussed Talking Safely Online. They examined the difference between online and in-person friendships, explored an online chat scenario, and completed and signed a checklist for safe online chatting. In the 7th and 8th grade, students discussed the importance of Protecting and Respecting Privacy Online. They learned how information online can easily get out of one’s control. A key message of the lesson is that although online information provides an incomplete picture of someone, it can still affect how others view that person. Please open the family Tips Sheets (Gr. 5/6, Gr. 7/8) for more information on these topics. You are encouraged to discuss these topics further with your children at home! This entry was posted in Middle School, Technology by Communications Department. Bookmark the permalink.